If a bestselling book now turned into a Christmas Day prime time TV animation simply tells the story of a stick (Stickman by Julia Donaldson), then anything is possible in a picture book. 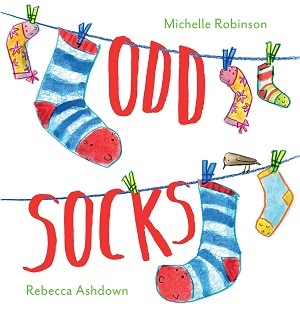 Odd Socks is a love story between a pair of socks, told in rhyming couplets for young children (and sentimental adults). With spools of humour and no whiff of smelly socks, this is an adorable new addition to any picture book collection. “Exactly,” said Sosh to his warm, woolly wife. The artworks extend the personification further. The room is bright, colourful in extremis – with a toy box bursting with personified toys, and brightly coloured knickknacks. The underwear drawer sports a pair of y-front pants with eyes and mouth – it’s not nearly as horrific as you might envisage – even the toy dinosaur betrays a friendly grin. The brightness spills onto the ensuing pages, with adventures galore when the pair of socks adorn their small human – partaking in all sorts of activities such as accompanying the boy to the park by being worn in all sorts of shoes – jellies and wellies…. Until the day a hole appears in Suki’s big toe. A common problem for children who wear socks! a loner, a moaner, a bit of a bully. More hilarity for those adults reading aloud to the children – the socks are pictured discussing the quandary on a washing line – each sock with animated expressive faces, against a bright and cheery garden backdrop. Look out for the cat and dog! The illustrations are deceptively simple – squiggles and curves – but with just the right amount of white space in between the lush colours to give shape to the book. The story continues – I shan’t ruin the excellent surprise ending – but the humour continues unabated from both author and illustrator – the use of the word ‘odd’ in particular, the search for missing socks and slippers including the deadly tumble dryer, and the dangers of the dog. Children will adore the action scenes depicting the dog, as well as the abundance of colour depicting the craft materials and doodled shapes that dominate the end of the book. It’s a love story, with domestic references to charm the whole family. The rhyming and scansion are perfect – the illustrations bright and cheery. This is a sharply observed well thought out picture book – there’s nothing woolly about it. It published in hardback this week – but it’s one of those you’ll want with a hard cover, in case, like the aforementioned sock – it develops defects from overuse! You can purchase your copy here.